The famous Abbot of St. Augustine's in Canterbury, was likely born in Libya Cyrenaica, North Africa. Adrian decided to become a monk early in life and eventually rose to the position of Abbot at Hiridanum (the Isle of Nisida), in the Bay of Naples. It was there that he became acquainted with the Emperor Constans II and later with Pope Vitalian. Adrian became a valuable advisor to the pontiff and, three years later, was offered the position of Archbishop of Canterbury. He declined the papal appointment, but was persuaded to accompany Theodore to England as a trusted counselor. After spending time in France, he arrived in Britain and immediately succeeded Benedict Biscop as Abbot of St. Augustine's Abbey in Canterbury. 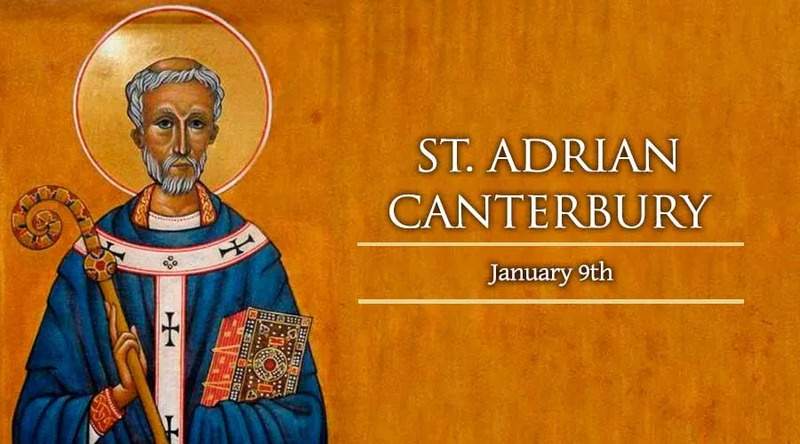 He established a flourishing monastic school, where many future bishops and abbots were educated in Latin, Greek, scripture, theology, Roman law and arithmetic. St. Adrain died on Jan. 9 at Canterbury, Kent. Several hundred years after his death, Adrian’s body was discovered in an incorrupt state.